Cold. 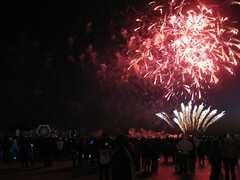 That will be my overriding memory of the 2010 Busan New Year Festival. The weather was the top subject on the news, with temperatures in Seoul dropping to -12.8°C, and it feeling like -20°C with the wind chill factor. Busan had predictably fared better, with daytime temperatures ranging from -10°C to -5°C, but we also had a wind chill factor to deal with. Heavy snow had fallen in a number of regions, but in the almost perpetually dry air of Korea's second biggest city, the atmosphere was perfectly clear and the only ice to be seen was in the frozen trickles of water and effluent discarded from the occasional shop-front. 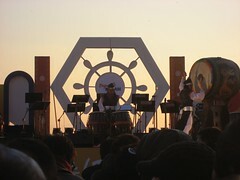 With overnight temperatures predicted to fall to -15°C, there were three activity options encompassed within the official Busan New Year Festival - 'Celebrating the Last Sunset' of 2009 at Dadaepo Beach between 4pm and 6.10pm, 'Ringing in the New Year' at Yongdusan Park between 11pm and 12.35am, and 'Celebrating the First Sunrise' of 2010 on Haeundae Beach between 6.30am and 8am. 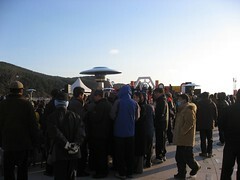 There was also a fourth option - traditionally Korean and outside any official event - climb a mountain for one-and-a-half hours to watch the sunrise - between around 4.30am and 8.30am, an activity so ill-advised it annually claims casualties even in less treacherous weather; the combination of alcohol, strenuous exercise, cold, narrow paths and near total darkness never being a good idea. I'd already had the Haeundae Beach New Year experience three years ago, and while it certainly was an experience just over two months into my Korean life, it was one I was agnostic about repeating. In any case, the forecast was for cloud the next morning. Again. 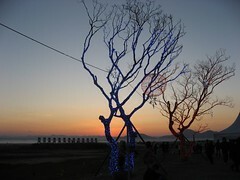 So I opted for 'Celebrating the Last Sunset' at Dadaepo Beach, on the grounds of temperature as much as anything. Despite the deceptively clear and sunny day, it was still so cold that one could rapidly begin to lose feeling in fingers and toes. 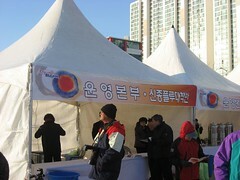 With no subway station, we arrived by taxi - a little late after heavy traffic - and activities were already under way. 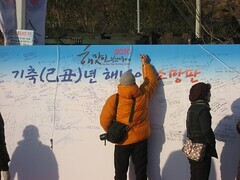 A samul nori troupe played on Fountain Square and people wrote their wishes for the New Year on a large message wall, though it is unclear what the person who had - in English - inscribed "I believe I can fly" was exactly hoping for. Someone else had apparently written their mobile phone number - perhaps making their aspirations a little easier to guess at. 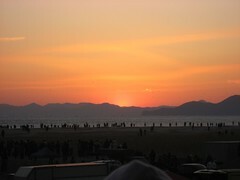 A quick scan of the horizon soon revealed the obvious flaw in the Busan government's cunning plan. 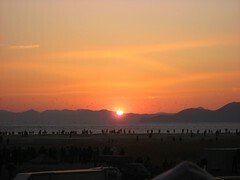 While the city enjoys some coastal areas to the west where the sun sets, Dadaepo Beach's Western horizon was not ocean-filled, but rather mountainous. While the official guide indicated the sunset time at 5.22pm, this would presumably be a little later than it would disappear from view where we were, which seemed to make the experience more arbitrary than it should have been. Tents to one side of the Square served hot drinks for free, and dispensed Swine 'Flu advice to anyone feeling ill. Inside another tent the Post Office gave out pre-stamped postcards which people could use to write messages before posting them into a giant postbox. On the Square, large outdoor heaters had been strategically placed around a seated area, and people were wisely beginning to strategically place themselves next to them. It was bracingly cold with a healthy wind blowing in from the sea. A jazz band began to play on the stage, and that seemed like a good plan - what better way to play down the sunset than with some soulful music? 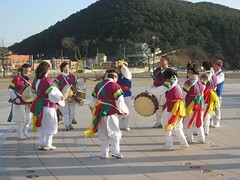 But before long they'd switched through various styles to settle into the type of tune popular with Korea's older generation. 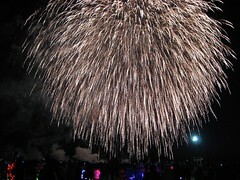 Gratingly, some began to sing. 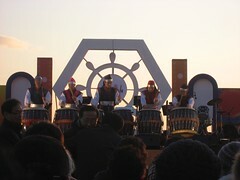 The band gave way to a Korean drumming performance, which transpired to also be a good accompaniment to the setting sun. 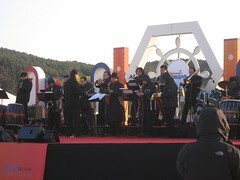 Unfortunately, views of the stage were somewhat obscured by the arrival of the Mayor of Busan in front of me, whom then preceded to enjoy a steady stream of visitors offering tribute, standing up. 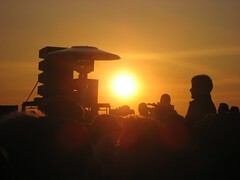 As the sun set many in the crowd unceremoniously dashed over to the edge of the Square to bid good riddance to one of the worst decades in recent memory. 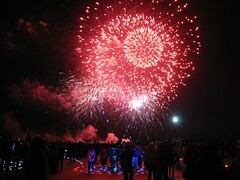 Evidently more still had foregone the music in favour of a more reflective view of the event from the shoreline. By this time, my toes had long since stopped reporting in, and the anti-shake on my camera was fighting a losing battle against my gloved but increasingly quivering hands. My wife and I sought shelter in a tent which transpired to have the best kept secret at the event - a portable gas fire where people shamelessly removed shoes in a futile attempt to avert the onset of frostbite. 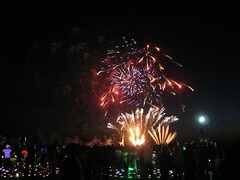 The event ended with fireworks, which exploded above us for our entertainment while beneath our feet the lights of the Square changed colour in some vague synchronisation with the accompanying music. 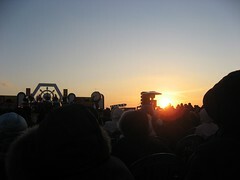 I'd seriously considered leaving after the sunset, mostly because of the cold but with an increasing concern as to how we were going to fight with 500 people for a taxi once the event finished, but stuck it out to the end. This was a mistake. Predictably, the moment the burning remnants from the last firework faded into the cold night sky, a mass of people moved from the Square to the road as though they were held together by some invisible force, which one sometimes suspects they actually are here. The police cunningly waved us down the path adjacent to the road rather than have us spill out into it in searching for rescue vehicles, so it appeared as though we had something of a walk ahead of us, on feet we could no longer feel. But twenty meters further along, a taxi appeared out of a dark side street as though it had been conjured up out of thin air. This highly improbable and near Biblically-miraculous event seemed to freeze the miserable masses around us to the spot momentarily, so it became our ride home. Or at least, that was the theory. A friend had phoned to warn us that it had just taken her thirty minutes to drive a mile in our area, and sure enough it wasn't long before we encountered the heaviest traffic jams I've ever seen in this city - and there was much to compare it to. Our progress became slower and slower, while the taxi meter - being based on movement and, crucially, time - ticked higher and higher. We discussed in English how far we could let things go before financial prudence demanded that we abandon the pervasive warmth of the vehicle and set out on foot in an unfamiliar district far from the navigable comfort of the nearest subway station. Even our driver saw the futility of the situation and volunteered to let us out whenever we wanted to go. Somehow though, we saw it through most of the way before our stop-loss kicked in and we were forced to hit the streets less than a mile from our home. I still hadn't completely warmed up. Brr!! Cold!! I thought we were having it cold at the moment but we're only around -10! 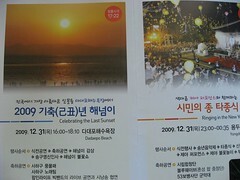 The last sunset sounds like a wonderful thing to celebrate--if not a cold thing! Thanks for sharing the photos and videos. It's great to be able to experience these things... sounds like a mad crush at the end though. Was it worth it? Or did the cold and crush of people destroy the atmosphere somewhat? Sometimes it seems there are an endless number of festivals going on, but I suspect they're all worth at least one visit to see what it's all about. I haven't got bored of them yet!